Our mission is to use state of the art ocean technology to study massive waves beneath the sea and the turbulence they create. We are a collection of scientists and engineers, led by Professor Matthew Alford. We strive to both improve our collective understanding of the complex physical processes in the ocean, primarily through observations, and to develop new techniques for better measuring these processes. We achieve the latter largely through advancements in the capabilities of oceanographic research moorings---such as never-before-used instrumentation, expanded capabilities of specific instruments, and novel mooring "systems" that combine technologies and instruments to achieve unprecedented observations. This site is intended to be an informative and entertaining look at the work we do. Find out who's on our team. This image (from Klymak et al, 2011) shows measurements we made in the South China Sea where some of the world's largest internal waves reside. The top panel shows measured velocity (colors) and the depths of density surfaces (black). The diurnal tide sweeps the ocean's layers up and down hundreds of meters once a day, while the flow moves strongly back and forth. This interaction with the bottom leads to huge overturns and turbulence (bottom panel). These breaking internal waves are our bread and butter - and are the power source for the turbulence that helps to drive the ocean's "conveyor belt" circulation. 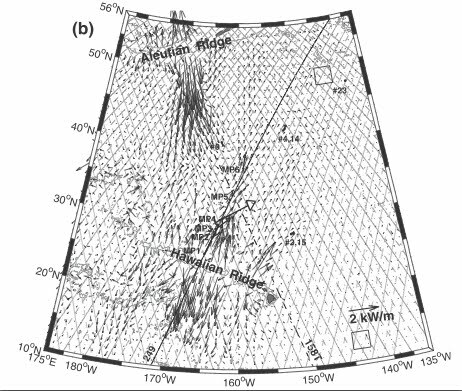 This map (Zhao and Alford, 2009) shows the energy flux in the "M2" (twice a day) internal waves in the North Pacific. We made this map from very precise measurements from the TOPEX altimetric satellite, which detects the deflections (only 1-3 cm!) of the sea surface. Beneath the surface, the waves move ocean layers up and down hundreds of meters near the sources, and tens of meters in the open ocean. This map shows that waves generated at Hawaii propagate over 1000 km to the north and south. Waves from the Aleutians propagate all the way to Hawaii, where they create interference patterns with the northbound waves from Hawaii. In 2006 we put out an array of moorings along the line shown to track these waves. This experiment, called Internal Waves Across the Pacific, measured the undersea signature - which the satellites can't see.